Pretty and practical—who said utilitarian items needed to be boring? Give your standard office supplies an upgrade by personalizing a plain notebook to suit your tastes without spending a fortune. Store bought office supplies can get pretty pricey after all. This simple project lets you add a stylish touch to a tool you use every day. Bold colors, a vivid pattern or metallic fabric all make fantastic choices when you’re DIY-ing this project. Go bold! A more playful take will be a surefire smile inducer—even when you’re hard at work. Start out with a piece of fabric that is large enough to cover the size notebook you’ve chosen. Cut the piece down to size so that there is roughly two inches overhang around the entire notebook. Iron your fabric piece gently to remove any creases that might be on the fabric. In a well-ventilated area and on a protective surface, gently spray the surface of the notebook with the spray adhesive. Don’t spray too close to the surface! Just a light even coat on the outside of the notebook will do. You’ll want to avoid the edges of the notebook. After waiting a few seconds, place and gently press the outside cover in the middle of the fabric. Open the notebook’s cover and gently press along the surface to make sure the fabric is lightly sticking to the cover. Cut the down the fabric slightly so there’s less excess around the edges of the notebook. Working like you’re wrapping a present, go around each edge and fold the outer piece of fabric over itself, so it’s touching the edge of the cover (your fabric will now have a flat edge). Glue the fabric together. Now fold the fabric over again and glue so the fabric is now attached to the book. For non-bulky corners, fold the edges in like a triangle before gluing. Where the spine is, cut the fabric down so it’s flush with the edge of the spine. Put a bit of glue on it to help it adhere and to prevent fraying. 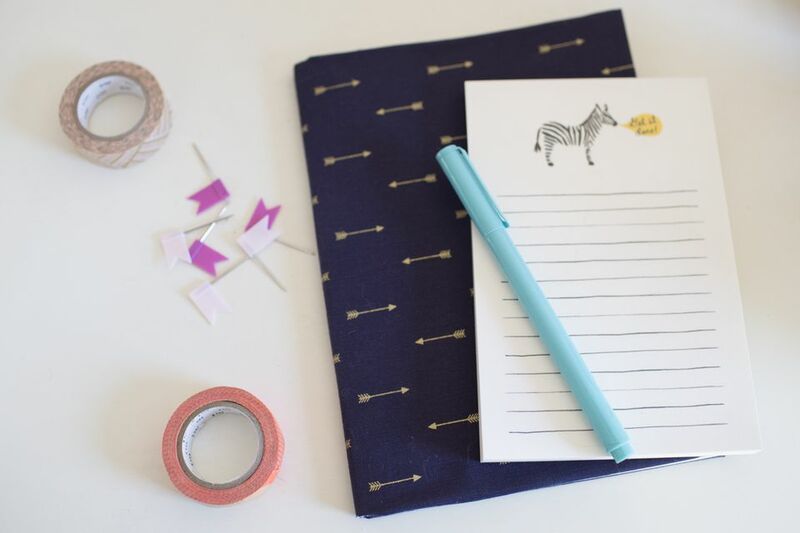 Slip oversized paper clips around the edge of the notebook to hold down the fabric until it’s dry. Wait to use the notebook until it’s completely dry, then place it on the top of your desk to catch any notes or to-dos that pop up. Not only will you revel in your own resourcefulness, but each time someone asks where you got your notebook, you’ll have the pleasure of responding that it’s one-of-a-kind. Plus, you can choose from any of your favorite fabrics or even better, you can use scraps from previous crafts. This simple project will take less than an hour to do yourself and will save you from overspending on pricey store-bought office supplies. Enjoy!